Edmond Mulet, Head of the Security Council Joint Investigative Mechanism on Chemical Weapon, briefs the Council. The Islamic State of Iraq and the Levant (ISIL/Da’esh) was responsible for using sulfur mustard in a September 2016 attack in Umm Hawsh and the Syrian Government was accountable for the release of sarin in an April 2017 attack in Khan Shaykhun, the head of a Security Council-mandated investigation said Tuesday. “There has been sufficient evidence of a credible and reliable nature to make its findings,” said Edmond Mulet, Head of the Organisation for the Prohibition of Chemical Weapons-UN Joint Investigative Mechanism (OPCW-UN JIM), during a briefing on the entity’s latest findings, released on 26 October. He said that despite the challenges of investigating complex cases during an armed conflict, the Mechanism has taken great care to ensure that its methodology and findings were technically and scientifically sound. Mr. Mulet noted that 12 Member States provided case-specific information, including Syria. The Mechanism interviewed over 30 witnesses and reviewed 2,247 photographs, 1,284 video files, 120 audio files and 639 documents. Technical teams visited Damascus and the Al-Shayrat air base in September and October. Syria has engaged constructively with the Mechanism. VIDEO:A UN report has named ISIL extremists and the Syrian Arab Republic for using chemicals as weapons in the country’s protracted conflict. This follows investigations conducted by a UN-mandated Joint Investigative Mechanism, led by Edmond Mulet. Although it was too dangerous to visit Umm Hawh and Khan Shaykum, the panel considered that sufficient information had been gathered to come to a solid conclusion. The Mechanism has also obtained independent expert analysis and assessments and consulted with several international recognized experts in energetic materials and the medical effects of chemical warfare agents. It cross-checked witness statements and ensured that information gathered was credible and reliable. As for the 15-16 September 2016 incident, two women were found to have been exposed to sulfur mustard at Umm Hawsh, he said. A mortar shell containing sulfur mustard hit the house of one of the victims and a second shell containing the chemical agent was recovered lodged in the pavement. Based on the positioning of ISIL and the forensic assessment that the mortar shell came from the direction of areas held by that group, the panel is confident that ISIL was responsible for the use of the mortar shells containing sulfur mustard. As for the 4 April incident involving sarin, it killed around 100 people in Khan Shaykhun. The Mechanism examined eight possible scenarios, including that the incident might have been staged to place responsibility on the Government of Syria, he said. The Mechanism has carefully put together pieces of a complex puzzle, of which some parts are still missing. It could not establish with certainty that the aircraft which delivered the chemical bomb had taken off from Al Shayrat air base, or the type of plane involved. However, Syrian aircraft was in the immediate vicinity of Khan Shaykhun at the time of the bombing. The crater was determined by experts to have been most likely caused by the impact of an aerial bomb travelling at high velocity. In-depth laboratory study into the chemistry of sarin has revealed that the nerve gas used was very likely to have been made from the same precursor chemical that had come from the original stockpile of Syria, based on unique markers. He said the panel is confident that when taken together, all those elements constituted unmistakable evidence that Syria was responsible for the use of sarin at Khan Shaykun. It is now up to the Council to consider the next steps, he said, asking the 15-member body that in doing so, it also consider the victims of those insidious acts. “Impunity must not prevail,” he said, pointing out that today, news about another instance of the use of chemical weapons in Syria has been received. Also briefing the Council was Izumi Nakamitsu, High Representative for Disarmament Affairs, who gave an update on the work of OPCW. Following a long-standing delay in gaining access, the OPCW is now conducting a visit to two stationary above-ground facilities to confirm their condition. This is the first step in the process of OPCW verification of the destruction of these facilities. She also expressed regret that neither the information provided during the consultations nor the latest submissions by the Syrian Arab Republic have enabled the resolution of all identified gaps, inconsistencies and discrepancies in Syria’s declaration. Efforts to resolve these issues have been hampered by a lack of original historical records, as well as an ongoing lack of access to and engagement with senior leaders and officials who have an overarching knowledge of the Syrian chemical weapons programme, she said. On 2 November, the OPCW Fact-Finding Mission submitted its report on the alleged incident of the use of chemical weapons at Ltamenah on 30 March 2017. Given the limitations in some evidence, the Mission was not able to determine “with absolute certainty” the use of a chemical weapon, but was able to determine the presence of sarin on samples that came from the alleged site of the incident. These most recent findings are deeply concerning – all the more so in view of the fact that the mandate of the OPCW-UN JIM is set to end on 16 November. 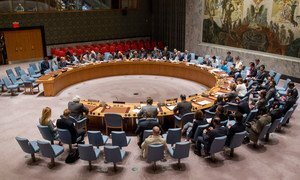 The Security Council on Tuesday failed to adopt a resolution extending the mandate of a joint United Nations-Organisation for the Prohibition of Chemical Weapon (OPCW) body to identify the perpetrators of chemical-weapons attacks in Syria due to a 'no' vote by permanent member Russia.